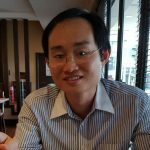 S&P Industries Sdn Bhd, the pioneer in the production and manufacturing of instant coconut milk powder in Malaysia, showcased its Kerra Coconut Spread at the recent Thaifex 2017 in Bangkok. 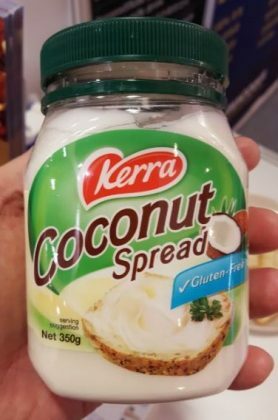 Kerra Coconut Spread comes in 200g and 400g. It is gluten-free and is a good source of fibre. The spread is kosher friendly and is certified halal by JAKIM. The coconut spread is ideal for lamington. 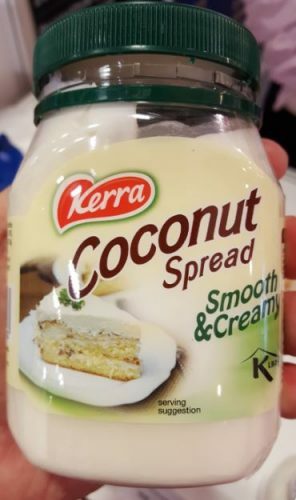 S&P Industries plans to export Kerra Coconut Spread to Australia, which will make Australia the first market for Kerra. The choice of Australia seems right as there are already similar products in the market including Tablelands Coconut Spread and Mayver’s Super Spread Coconut. 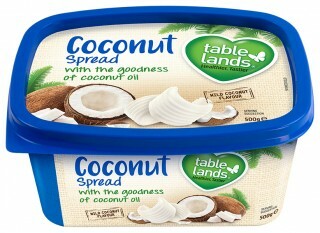 Coconut spread is marketed as a healthier spread offering less saturated fat than butter and rich in vitamin A and D.
Tablelands Coconut Spread contains coconut oil (31%), water, canola oil, vegetable oil, salt, emulsifiers (471, 322 from soybean), natural flavour, preservative, lactic acid, vitamins A & D. It is available in Malaysia and Singapore. 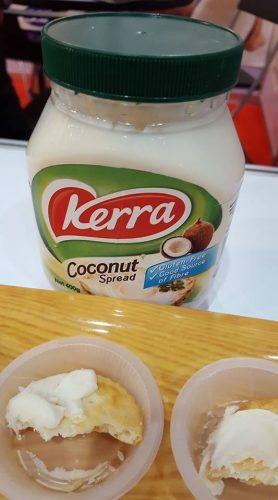 Kerra Coconut Spread is made from coconut (38%), inulin, vegetable oil, sugar, skim milk, emulsifier (E471, E492, E476 and E451i), citric acid (E330) and antioxidant (E307a). Here is the look of the product with the final design as seen at Taipei International Food Show in June 2017.